Design Burd Inc.The Next Generation of Health | Design Burd Inc.
We're all about promoting a healthy lifestyle here at Design Burd, which is why we're excited to design, host, and maintain Bio Nutrition Inc. Using an eye catching image changing background and an easy-to-navigate layout, we worked with Bio Nutrition Inc to make shopping for nutrition effortless. 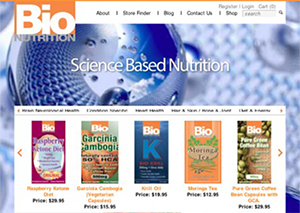 So take a look at Bio Nutrition Inc., and get inspired to start maintaining a healthy lifestyle.